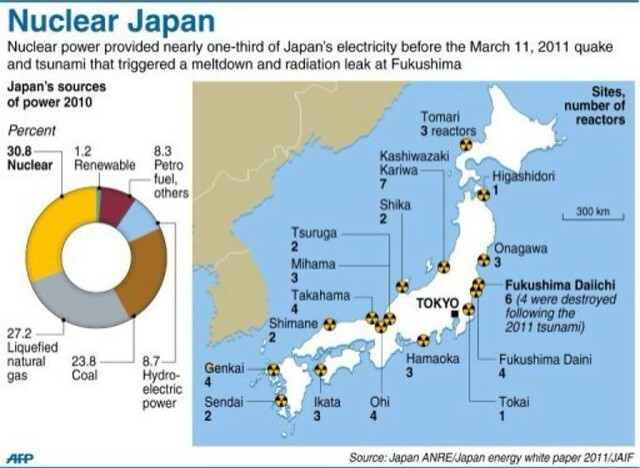 On September 14, 2012, Japan announced that it too would phase out nuclear power generation by 2040 and would further develop renewable sources. Japan trails only the United States and France in nuclear power generation capacity, and replacing the country’s 49,000-megawatt nuclear generating capacity could mean a big boost for both green energy and natural gas suppliers. A possible downside is that Japan would increase imports of crude oil, which it also has been burning to generate electricity to replace production from Fukushima. According to the Financial Times, Japan’s remaining 50 nuclear plants will be shut down once they reach an operating lifetime of 40 years and no new nukes will be constructed. The last plants were built in 2006. Japan’s nuclear plants provided about 30% of the country’s electricity and the country had planned to raise that to 50% by 2030. Today only one of the country’s nukes is still in operation and the rest were not restarted following shutdowns for safety inspections. That was not because the plants failed the inspections, but because the government responded to public demands to keep the nukes closed. Japan is the world’s largest importer of natural gas, virtually all of it in the form of liquid natural gas (LNG.) The large LNG projects in the Middle East, South Asia and Australia have already gotten a boost, and that boost will last longer and may get larger for big LNG producers like Shell, Chevron, and ConocoPhillips. Japan currently has about 7% of the world’s total solar power capacity, and most analysts expect that number to rise significantly. Japan boosted its feed-in tariffs for solar power to $0.53 per kilowatt-hour in June over a period lasting for the next 20 years. Japan’s Sharp is the world’s largest producer of solar PV panels, and with Kyocera poses a significant obstacle to foreign solar makers like First Solar and SunPower. Malaysia, through MNPC (Malaysia Nuclear Power Corporation) is said to be preparing a Nuclear Power Infrastructure Development Plan by 2013 to deliver Malaysia’s first nuclear power plant by 2021. 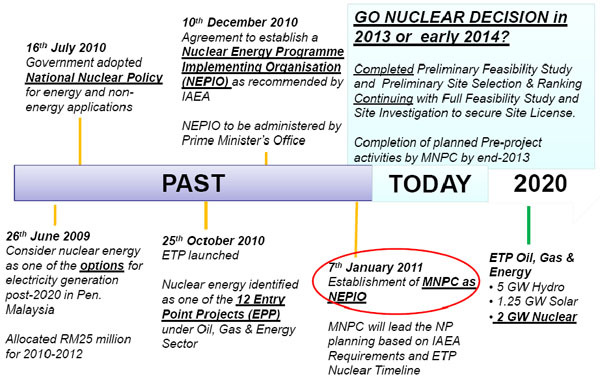 Earlier this year, MNPC and TNB revealed that the Nuclear Power Plant project has tiptoed to an advanced stage of development and that the final decision to “go nuclear” would be made next year or in 2014. Malaysia's plan to go nuclear is of great concern because Japan and France - the two supporters of nuclear energy - apparently have made major decisions to back away from reliance on nuclear power. Germany announced earlier, after last year's disaster at Fukushima Daiichi nuclear plant, that it would abandon nuclear power generation by 2022. So, it is very wrong for Malaysia to go the opposite direction. It does have many other alternatives other than nuclear.